My 1985 hilux 4 runner 3y carby needs a new engine . I have had vehicle for many years intend keeping for many years yet . Well questions should i buy New 4y carby Engine. A Bit Dearer ,.......................New 4y efi Engine . Assuming New 4 y efi comes with ecu unit . Questions is other changes needed too run 4efi if i go that way . ps. Vehicle is sr5 model . Power steering air/con . Manual and of a course sfa . Please all coments sound advice Welcome . pps , One more question Whats does Bakkie mean ??? lol. No one has ever made it out alive yet . If I recall, the 3Y and 4 Y are the same blocks, just different bores/strokes increasing the displacement. Therefore it should be a straight swap. As for the newer 4Y coming with the management, I really doubt it tbh, you'd have to source either an original 1 along with it's harness or buy the after market type with harness. 4Y EFI, is a beaut, I used to run 1 and way better then any carb setup. Russell, Bakkie = UTE in Aussie Speak. Guys , Just rechecking prices 4y efi seems overpriced . 2rz /3rz seems competitive . But would they be worth the trouble .Too much strain on trans/diffs etc . At least i can thrash begazzeas out of 3 y bush bashing my pocket dont hurt . ps.. Aus is Kool . Will splash photos when cuu cuu kodak system working proper . 2. High pressure fuel filter. 8. 2 x 90 degree silicon bends between the airbox and intake manifold. 9. Few fuel hose clamps. 10. Fwe home made brackets for ICV and fuel pump. 11. New Intake&Outlet Manifold gasket. 12. Modify your trottle cable. Above are just about that I could quickly remember, this setup will give about 76Hp on 31" wheels. For 4x4'ing it is almost better as a diesel at low rpm. You will need: The 3rz bell housing ( fits on your box ), the Radiator and hoses, management system. Thanks think im ok for time been . Update ordered 4y from china . I insisted on payment using paypal/ escrow only for better protection. Engine company says thats fine . Weeks later found out Order was cancelled by them . My money was refunded but i was disapointed after there promise etc . As site says escrow etc welcome as payment method . Anyways good news for me , Whilst i would have been thrilled with and ready for a brand new engine . I twisted my cousins arm . He was all for new engine as well lol. We took head off . Very lucky on testing just needed skimming . Ive been concerned for ages perhaps lots damage . Have been running via chemiweld last 2 years . Now next chapter . Lots life left in this Hilux yet Id love too get hold of one of those vw jetta carbs . Picking up a complete new 4 y carby model engine locally next week . Through checking other post the list too swap over from original engine is . If ive got it Right . Sump......... oil pick up ? Carburator ......Original recently overhauled . Distributor ......Original has points . Possibly Pulleys etc for power steering air con . New Radiator Hoses . Original well ive never replaced them in twenty years and they r still good ..lol . ps . 3 y engine only lasted less than 12 months on last repair No 4 went again . Is running fine but has Sealup helping out . Your comments and sound advice most welcome Thanks Russell . This is 3y engine pictures current . If I had to replace an engine in such a bakkie, I would opt for a Lexus V8 import with a G-box. Total cost of coversion between R2dk-R30k. Lots of torque and power, more economical than the 4 cyl motor. Must be done by a reputable specialist. I've these conversions on various vehicles and the work great! 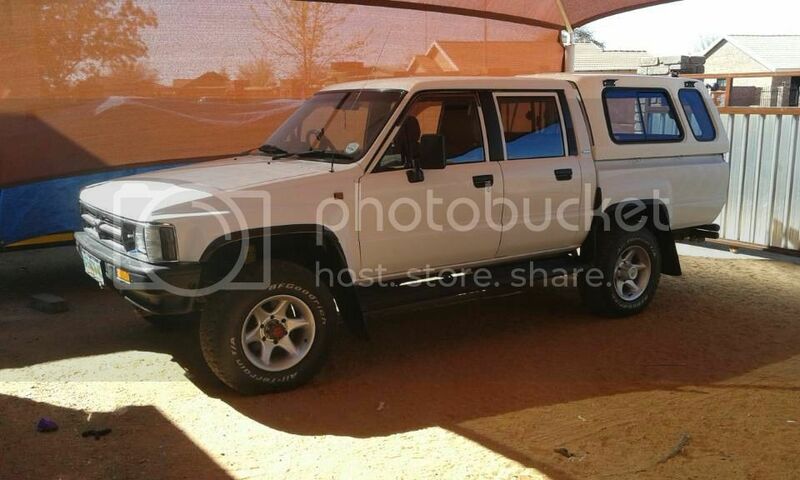 P Smit wrote: If I had to replace an engine in such a bakkie, I would opt for a Lexus V8 import with a G-box. Total cost of coversion between R2dk-R30k. Lots of torque and power, more economical than the 4 cyl motor. Had new 4 y engine for 18 months now about 15000klms . Only issues had fuel pump gasket leak from new . Ticking noise when not under load . Have been checked out timing etc . two mechanics say no issue . But have time next month too hopefully fix . Just annoying . Cool! I wouldn't worry too much about the 'ticking' noise .... could just be a hydraulic lifter or perhaps timing chain. If ou were going to have issues, you'd already have had them. Hey Russell, My bakkie's 4Y imported engine also had a ticking noise and I have replaced the hydraulic lifters several times to cure the itch, but without it being a success. Don’t know what type of oil you are using in the engine, but a local lube guru advised me to try Total's Quartz 5000 20W50 engine oil and this had fixed the ticking noise. The man who smile when things go wrong thought of someone to blame it on! Thanks guys due for oil change . Yes ticking seems not damaging just annoying . Update , New China Engine . Now 35000 klms no oil usage but does go very black quick perhaps fuel ? . Electronic dizzy broke , Alternater same Parts from my older original 3 y I fitted in place . All great . Ticking noise is a bit quieter not quiet like the sweet 3y ive had for like ever .